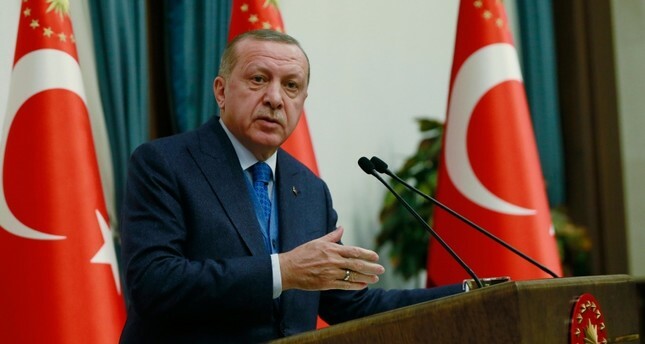 President Recep Tayyip Erdoğan said Thursday evening that Turkey is ready to take over the duty of fighting against terrorism in Syria, referring to his U.S. counterpart Donald Trump's decision to withdraw troops from Syria. "U.S. withdrawal from Syria should not leave a gap in governance and security in the region. We are ready to undertake the responsibility," Erdoğan said at an event hosting members of the U.S. Chamber of Commerce and American-Turkish Council at the Presidential Complex in Ankara. "Creation of a safe zone in northern Syria is crucial," the president said. "Turkey is determined to fight against all terrorist groups, particularly Daesh, which poses a great threat to the region and the world." In regard to strained Ankara-Washington relations over U.S. support for the PKK's Syrian wing, the People's Protection Units (YPG) terrorist group, Erdoğan said initiatives by Trump have thwarted efforts to heighten tensions between the two NATO allies. "Trump's latest initiative in Syria has foiled the plans of those trying to undermine Turkey-U.S. relations," he said. However, he warned that continued U.S. support for the YPG would undoubtedly have "consequences." "The U.S. has unfortunately decided to continue supporting YPG in Syria. I believe that this move's consequences will become clear in near future," he said. In regard to the YPG, Erdoğan said: "Equating the PKK/YPG terrorist group with local civilians is the biggest insult to our Kurdish brothers." On the bilateral relations between Turkey and the U.S., Erdogan said that the two NATO allies have successfully overcome the problems they have faced. Turkey and the U.S. have a strong, comprehensive and strategic alliance based on common interests, he added. Erdoğan also said Trump offered to increase the two countries' bilateral trade volume to $75 billion. "I gladly accepted it," he said. Turkey wants to set up the safe zone in northern Syria with logistical support from allies and says it should be cleared of the U.S.-backed YPG terrorists. In June, Ankara and Washington agreed on a road map that would see the YPG removed from Manbij in northern Syria. Turkey has repeatedly expressed its frustration that the implementation of the plan has been delayed. Erdoğan said Tuesday that Turkey would only wait a few weeks for militants to be removed from Manbij. The U.S.-backed Syrian Democratic Forces (SDF), which is spearheaded by the YPG terrorists, have controlled Manbij since 2016.